Pikes Peak is located in the Pike National Forest about 10 miles west of Colorado Springs and about 8,000 feet in elevation above the city. It is one of Colorado’s most popular attractions. The peak’s 14,110-foot summit can be reached by cog railway or toll road – or by foot on the 11-mile 12.6-mile Barr National Recreation Trail,, which climbs 7,500 feet in altitude from Manitou Springs. Campgrounds and summer and winter sports opportunities abound. Access to the 19-mile toll road to the summit is at Cascade, off U.S. 24 west of Colorado Springs. The road had long been paved only halfway up the mountain, but plans call for the last stretch to be paved by 2012. The Glen Cove Inn, North Slope Recreation Area, Crystal Reservoir Gift Shop and Summit House are available to visitors. Pikes Peak is named for Zebulon M. Pike, leader of an expedition to explore the southwestern part of the Louisiana Purchase in 1806-07. Pike tried to climb the peak in November 1806 but was forced back by waist-deep snow and freezing temperatures. He wrote in his journal that he thought the peak was unclimbable. In 1820, Edwin James, a botanist who had just graduated from Middlebury College in Vermont, left the Long Expedition as it passed close to the peak and, with two others, climbed the peak in two days. On the trip, James became the first scientist to describe the blue columbine, which became Colorado’s state flower. 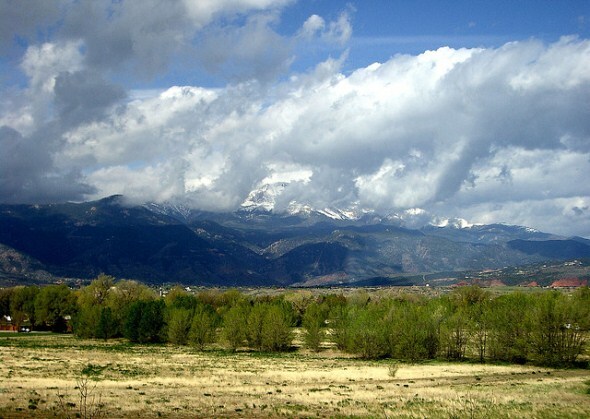 After gold was discovered near Denver in 1858, “Pikes Peak or Bust” became the rallying cry for the miners who flooded the state. Major gold deposits were discovered southwest of Pikes Peak in Cripple Creek in 1893, spurring another round of the gold rush. In 1893, Katharine Lee Bates wrote the song “America the Beautiful” after taking in the view from the top of Pikes Peak. A commemorative plaque with the words to the song was placed at the summit. A marathon race, the Pikes Peak Ascent, climbs the mountain each August, as does the Pikes Peak Auto Hill Climb auto race. Members of the AdAmAn Club climb to the top to set off a New Year’s fireworks display at midnight each Dec. 31.